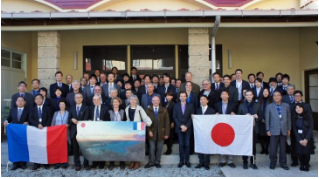 Both French and Japanese Societies of Oceanography have as main objective to promote relationship and exchanges between specialists of the two countries involved not only in the field of oceanography, but also in the development and production of natural and cultured marine resources. These relationships both friendly, cultural and scientific is therefore not confined to the field of academic science, but also to the exchange of knowledge and expertise particularly in the fields of fisheries, aquaculture or integrated management of coastlines and coastal areas. This is why a network of researchers, but also managers or marine producers join or accompany the initiative undertaken by the two societies and can facilitate contacts between actors. They are networks of knowledge and relations useful for the cooperation between the two countries for the sustainable management of marine resources. 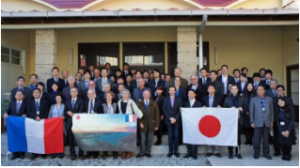 If the networks of researchers and dissemination of academic knowledge are at the core of exchanges between these two learned societies , listening and mutual assistance between the French and Japanese maritime communities constitute one of the strengths of this cooperation. Some examples illustrating these links that go beyond the professional or scientific relationship. Mutual assistance between oyster farmers . In the sixties, a disease affected wild and cultivated stocks of Portuguese oyster (Crassostrea angulata ). It must also be remembered that the production of flat oyster (Ostrea edulis ) were already very small at that time. The French oyster industry suffered an unprecedented crisis with very serious economic and social impacts. 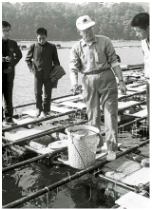 In 1966, the Director of the La Tremblade Research Station ( P. Trochan ) contacted the Professor Imai of Tohoku University to see if it was possible to export Japanese oyster spat rapidly . With the help of the scientific advisor of the French Embassy in Japan ( M. Dupuis ) and the SFJO Japan created in 1960 by Professor Sasaki , Japanese scientists and professionals prepared with skill and celerety 20 parcels each containing 40kg of spats for a first trial. 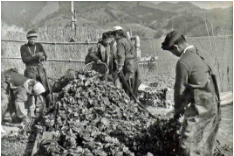 Given the good growth and low mortality, 80 parcels were sent in 1967 and 10,000 the following year and 10 million of spat in 1969 was transported by air to relaunch the French oyster farming. More than a moral support to mitigate the effects of the Tsunami. March 11, 2011 , a tsunami of extreme violence fall on the coast of the province of Sanriku in the north- eastern part of Japan. 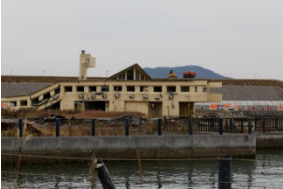 This tsunami destroyed everything in its path and ravaged the port and aquaculture facilities and research laboratories necessary for the monitoring of marine resources. Faced with this disaster , the presidents of France and SFJO, ADA (Association pour le Développement de l’Aquaculture) decided to provide the contribution of the two associations in the chain of solidarity that was created to help fishing communities and affected farmers. 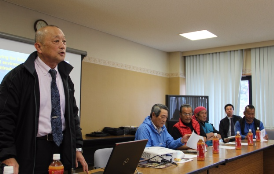 Meanwhile, SFJO Japan sets up a aquaculture support committee that manages the material and financial aid received. 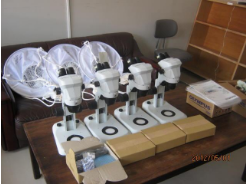 July 29, 2011, the first scientific materials from France are routed: plankton nets to harvest the larvae of oysters, optical materials for plancton analysis. In December 2011 and in February 2012, visits of ADA and SFJO France are organized to demonstrate the support of the French community to Japanese oyster farmers. This visit was completed in September 2011 with the arrival of a delegation of Japanese professionals in Britany and then by sending equipments for oyster cultivation in January 2012 thanks to the French oyster industry who have not forgotten the assistance previously provided by Japanese scientists and professionals. This shipment enables an accelerated start of the oyster industry, which has now almost achieved its level of production of the pre-tsunami period in this area heavily affected by the tsunami effects. It is natural that during the last symposia representatives of professional organizations in fisheries and aquaculture actively participated in the exchanges and discussions on the management and future of marine resources and habitats . Organize meetings on topics decided jointly by both academic societies . It is a key objective of both societies. The first symposium took place in 1983 in Montpellier. The sixteenth was held in Japan in November 2015 at Shiogama in the Sendai province on the north-eastern coast of Japan. In recent years, interdisciplinary topics have been defined as they are a space for exchanges of knowledge that may help to better take into account the complexity of socio-ecosystems studied in a context of global change and sustainable management of goods and services provided by these natural systems. These events are not only places of scientific exchanges, but also proposals for research and development projects interesting the two countries.